October 30, 2013 /1 Comment/in Shoe Odor /by Jenn F.
Leather is said to be one of the most breathable shoe materials. So why does it seem like your feet sweat and stink mercilessly in a pair of your favorite dress shoes? For starters, you may think you are wearing leather with its glorious breathable pores… but in reality, your shoes may be made from synthetic leather, which has become popular these days because it’s so cheap to manufacture. (Instead, you want to make sure you’re getting full-grain leather shoes!) However, it’s important to note that even real leather can mingle with the wrong type of socks and make your feet sweat. Also, bacteria can build up on any type of shoe material, causing an unbearable stench emanating from your shoes — and stinky feet to boot! WikiHow will attest to the fact that leather grains can absorb everything from body odor and tobacco smoke to mold and food odors. It is also harder to clean leather because this material can break down if you use harsh cleaning agents on it. For instance, you don’t want to use anything like Windex, 409, Mr. Clean, or even the “all-natural” baking soda and vinegar on your precious leather shoes. – Invest in a cedar wood shoe tree like cobblers use. This will remove excess moisture (and odor), while helping your leather maintain its natural shape. – Be sure to put leather protector spray or rub on your shoes as soon as you get them to protect from the elements. – Apply petroleum jelly or leather moisturizer to keep the surface safe from cracks and maintain shine. – Avoid using saddle soap, which requires rinsing — which can cause small fissures to develop. – Never place wet shoes by fire or a heater to dry. This will cause cracking! – Stuff towels or newspapers in the shoes to soak up moisture. Sometimes you can get away with placing a stinky article of clothing outside in the fresh, cool air for a few hours. 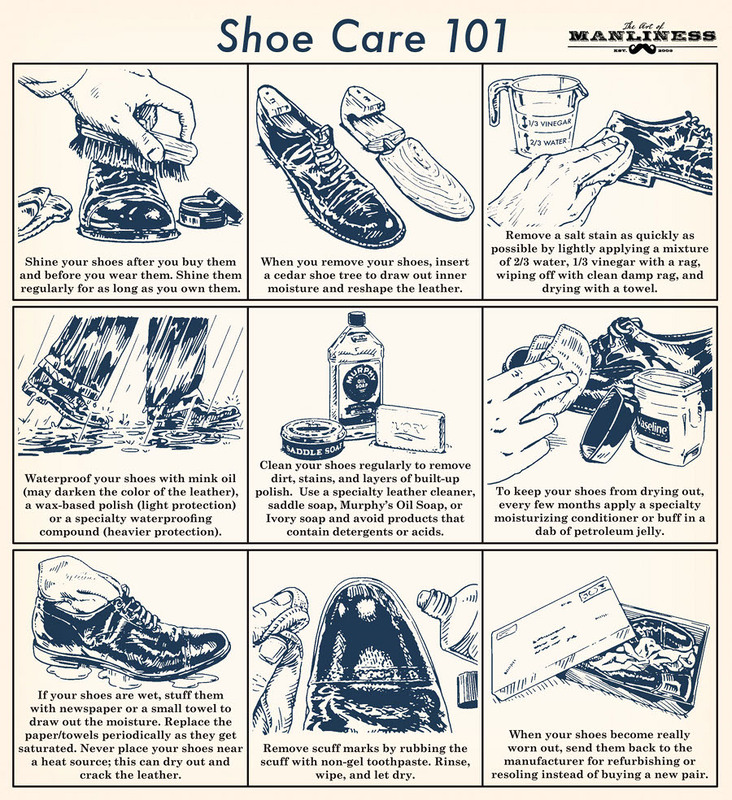 You can also use a product like Kiwi Honor Guard to polish your leather and wrap the shoes in newspaper to absorb smells. Remember, bacteria is what mostly causes foul odors in footwear. You can use the SteriShoe UV Shoe Sanitizer to get stink out of shoes and kill up to 99.9% of the microorganisms living in your leather footwear in just 45 minutes. The UVC light will also dry out the moisture in your shoes. Even so, it’s recommended that you alternate shoes every other day to avoid wearing wet shoes where bacteria likes to thrive. Thanks for sharing this kind of useful information. Hope to hear more from you about more tips about leather products. Again Thanks!